Posted on October 18, 2017 - By Fucosoft | Follow YouTube, Twitter to Get More Information. Notes on iPhone is really helpful, providing great way to keep bank codes, shopping list, work schedules, important tasks, or random thoughts etc. However, there are some common problems people may have with it, such as “iPhone Notes Disappeared”. If you’re wondering how to retrieve deleted notes on iPhone or iPad, don’t worry, here we’ll cover 4 easy ways to guide you getting lost notes back. Tap on the back arrow in the upper-left corner to view all Folders in the Notes App. Then find and tap on “Recently Deleted” folder. Tap on “Edit”, select your deleted notes or tap “Move All” and click on “Move To…”. Then choose the folder you want to move the deleted notes back to. If you have the good habit of backing up your iPhone to iCloud, you may be in luck. Your deleted notes may be included in the iCloud backup and you can easily retrieve them back. 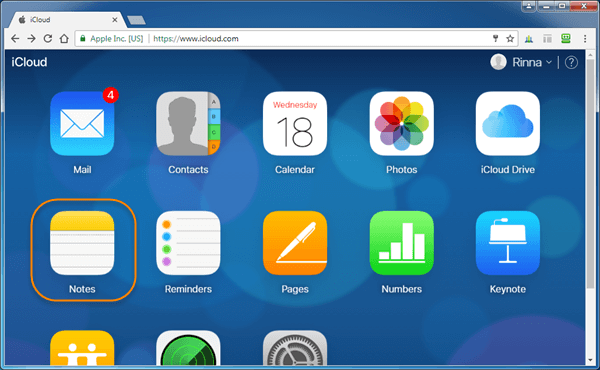 Go to iCloud.com on your computer and sign into your account. Then click on “Notes” icon. Click on “Recently Deleted” and you’ll see the list of the recently deleted notes. Click on the one you want to recover. Click on “Recover”, the deleted notes will retrieve back to your iPhone/iPad soon. You may have created Notes using your Google or other email account, and your deleted notes may be synced with that account. You can easily recover notes from iPhone by setting up your account again. On your iPhone, go to Settings > Accounts & Passwords and tap on “Add Account”. Choose “Google” or other cloud services, and login in with your email and password. Toggle “Notes” on and click “Save”. Then back to Notes app and swipe down from the top to refresh and recover notes. Step 1. Download the iPhone Notes Recovery software and lunch it after installation. Click on “Recover from iOS Device”. Step 2. Connect your iPhone/iPad to the computer using a USB cable. Once the program has detected the device, click “Start” to continue. Step 3: Now choose “Notes” or any other files that you’d like to recover, then click on “Scan” to begin scanning your iPhone for deleted files. Step 4. When the scan is complete, preview the Notes in the scan result and choose the ones you need, then click “Recover” to save them to your computer. Note: If you can’t recover deleted notes on iPhone directly due to overwritten, you can use this iPhone Recovery software to retrieve notes by extracting from iTunes or iCloud backup, provided that you have make a backup in advance.